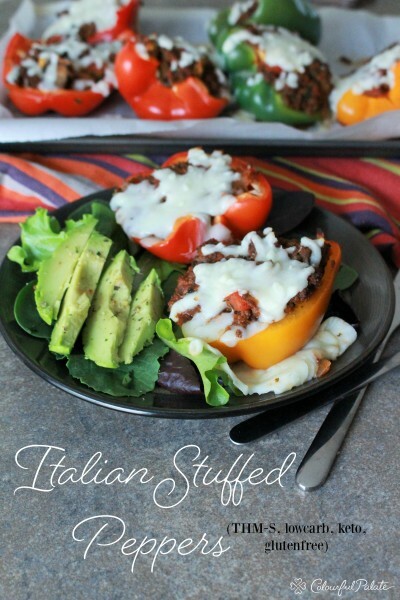 Low Carb Italian Stuffed Peppers was posted on April 5th, 2016 and is filed under Gluten Free, Low Carb, Main Dishes, Protein, Recipes. This entry has 4 comments. You can follow any responses through the RSS 2.0 Comment Feed. Once in a while, I have a spaghetti and meatballs craving…and what I’ve noticed is that these cravings can be easily satisfied without caving into actual pasta. A few days ago I made these stuffed peppers for lunches/dinners for my work week. I can have 1 (or 2!) a day and I’m set! They have all that Italian flavour, delicious “meaty” sauce, some amazing protein to hold you over and it’s all covered in love (i.e. cheese). It’s low carb, no sugar, high protein, and fairly low calorie. Pair it with a big salad and some cooked veggies and you have a perfectly balanced low carb dinner. Serves 4 (if you have 2 halves each). Directions: Cook your ground beef, set aside. Add salt and pepper. In a frying pan, cook your onion and garlic until translucent. Add mushrooms and parsley and fry till wilted and soft. Add to beef mixture. Preheat oven to 400 degrees. Add spices and tomato sauce and let simmer for 10-15 minutes on low. Line parchment paper on a baking pan. Slice the peppers in half and take the core out carefully. Fill halves of pepper with beef mixture and bake for 10 minutes. You may have a bit extra of beef mixture, depending on how big your peppers are. Save and add to my favourite chilli recipe (make it not vegan!). Take pan out of oven and top with grated cheese and put back into oven until the cheese in warm and slightly browned. Serve warm. What’s an Italian dish you love? 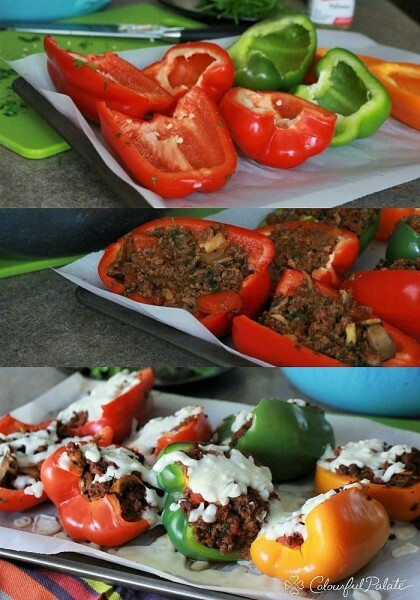 Have you ever stuffed peppers? Mmmm those looks just utterly DELICIOUS!! Yummm…. I love stuffed peppers and have not made any in forever. This reminds me that I need to get on it. Think I’ll try your style this time. These look delightful! 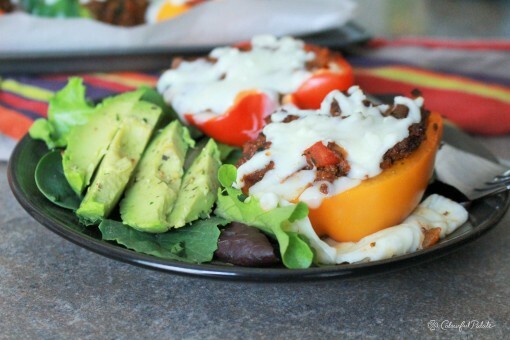 Stuffed peppers are one of my favorite dinner staples!